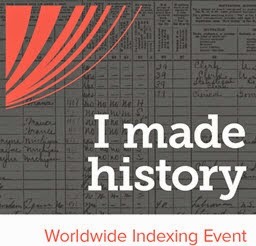 I thought I would highlight my great grand aunt, WINIFRED OWEN, today because she was born on December 25, 1858 in Holyhead, Wales. Here is a news article I found in one of my mom’s scrapbooks. Unfortunately, there was no notation as to what paper printed this article, so I apologize for not citing it. According to the 1900 U.S. Census, Winifred immigrated to this country in 1875. (3) She was only 17. 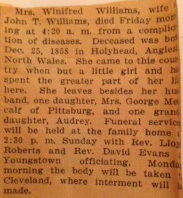 Winifred’s sister was my great grandmother, JANE OWEN (1860-1941). 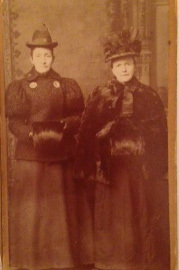 Here is a picture of Winifred and Jane. Aren’t you glad those hats are out of style? I thank God every day for my mom’s appreciation for family history! From Jane Owen’s marriage certificate I learned that Jane and Winifred’s father was ROBERT OWEN. (6) I was able to locate the family on the 1861 England Wales & Scotland Census, but that’s all I know for now. The Welsh repetitive naming system is tricky. Who out there is having difficulty with Welsh research? The names I am grappling with are Williams, Lewis, Owen and Pritchard. I would love to hear about your hits and misses. The Surnames of Wales by John & Sheila Rowlands, Baltimore, Maryland, Genealogical Publishing Company, 1996. Welsh Family History, Second Edition, edited by John & Sheila Rowlands, Baltimore, Maryland: Genealogical Publishing Company, 1998. I wish all my readers a Happy Holiday! Dover Publications, Inc., Mineola, New York, Electronic Clip Art, "Full-Color Holiday Vignettes," 2001. (1) 1900 U.S. Census, Trumbull County, Ohio, population schedule, Weathersfield, Enumeration District (ED) 0125, sheet 1, p. 1B (stamped), dwelling 22, family 23, Winnifred Williams; digital image, Ancestry.com (http://www.ancestry.com: accessed December 25, 2012), citing National Archives microfilm publication T623, 1854 rolls. (2) 1910 U.S. Census, Trumbull County, Ohio, population schedule, Weathersfield, Enumeration District (ED) 0240, sheet 73, p. 7B (stamped), dwelling 60, family 63, Winefred Williams; digital image, Ancestry.com (http://www.ancestry.com: accessed December 25, 2012), citing National Archives microfilm publication T624, 1,178 rolls. (3) Op. cit., 1900 Census. (4) Scrapbook entry by Jane Williams Cutler Taylor. Current location of scrapbook: home of Karin Hadden. (5) Ohio Death Certificate Index, The Ohio Historical Society, (http://ohsweb.ohiohistory.org/death//results.cfm: accessed December 25, 2012). (6) Certificate of Marriage, William Williams and Jane Owen, 15 September 1880, New Tabernacle Chapel, County of Anglesey, Wales, Entry No. 100.